We’ve known for more than a decade that relevancy drives email marketing results. Getting a message or offer that’s tailored to your needs and circumstances is much more likely to be effective than an unfocused, blanket email that’s sent to an entire database at the same time. 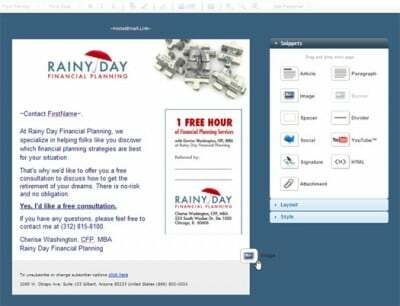 This ability to customize email and send different versions to different subscribers is often called “dynamic content” and has been available for quite some time, although mostly within enterprise class email software like ExactTarget. Beyond dynamic content lies the fertile ground of marketing automation, whereby email doesn’t just contain different information based on the characteristics of the recipient, the email itself is sent (or isn’t sent) based on behavioral criteria. For example, if a prospect in your database has visited your website three times in a week a “nudge” email is sent. This is marketing that approaches the “one to one” capability that professional communicators have dreamed about since the 1950s. Marketing automation of this type has been a reality for a few years, but has been contained in software like Marketo and Eloqua that is most appropriate for mid-sized and larger companies. But now, Infusionsoft makes marketing automation a reality for small business – the very category of company that hyper-intelligent targeting can help the most. Small business doesn’t have the scale to paper over flabby communication campaigns with budget and frequency. They have to (or at least should) use every customer touch point as an opportunity to build meaningful relationships and drive transactions. Infusionsoft is built with that philosophy at the forefront. A software as a service (SAAS) company based in Gilbert, Arizona (where I first became aware of them while living in the area), Infusionsoft has been on the Inc. Magazine list of America’s fastest-growing private companies for five years in a row. While the software itself is almost uniformly excellent, I believe Infusionsoft’s real advantage is their focus. They are the automation package for information marketers, professional services firms, and smallish retailers and e-tailers. Infusionsoft knows what their software does well and who can best take advantage of it, and they are very good at reaching out to that prospective customer base (including excellent use of social media and community management from my old pal Joe Manna). Of course you can use Infusionsoft to send email newsletters and other publications where everyone gets the same message, but that’s like swatting flies with a baseball bat. The real use case is automated email creation and delivery based on conditional logic and customer behavior. Essentially, you treat each customer and his/her circumstances as its very own marketing initiative. 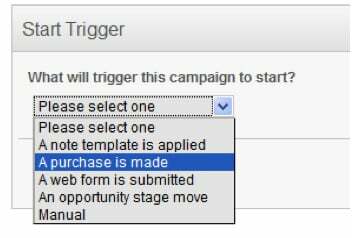 Within the software you create a campaign and define a starting behavior (such as filling out an online form). Then, you plot a series of follows ups to be automatically sent at pre-determined intervals (such as 3 different email offers sent 6 days apart). This follow up sequence can be as long and complex as you like, including layer upon layer of secondary sequences. You also define a stop point where the campaign ceases to operate, such as “purchased online”. 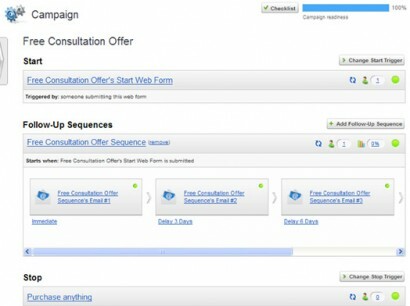 Your prospects can automatically be set to jump between campaigns as well. If a prospect is in a regular campaign but then clicks a particular link on your site that indicates high intent to purchase, Infusionsoft can automatically move that prospect into a “hot lead” campaign, sending a different sequence of messages as a result. Note that one of the elements of Infusionsoft I really like is their in-house “success coaches” who help you think through what types of campaigns and follow-up sequences you should build, and in what scenarios they should be deployed to build your business. Incidentally, while email is the most likely ingredient in your follow-up mix, you can also use Infusionsoft to send voice mails, faxes, and snail mail. Part of the problem companies often face today is having multiple software packages to accomplish related tasks within their organization. One provider for email, one for customer data, one for website management, one for social media management, and the list goes on and on like Kim Kardashian’s matrimony excuses. Infusionsoft is much closer to an all-in-one system. Certainly you can email/fax/voice mail from Infusionsoft. But the system also creates and hosts Web forms and links (for triggering campaigns and tracking ROI); serves as a rich and real-time customer database (excellent for salespeople); and includes e-commerce components like shopping carts and product pages, including dynamic discounts and coupon codes. You can even automatically insert links/icons for your social media presences across your Web assets, and more social media functionality is on the way. You need to learn the Infusionsoft interface, and intuitive layout is the one area where the system could easily improve. But once you understand where and what to click within the system you’ll find that making emails and forms and pages within Infusionsoft is a snap. Even non-technical folks with the design and layout sensibility of a Hoarder can operate the software, and if you have professional graphics created by a pro you can store them in the database for instant retrieval and placement. Because Infusionsoft can power most aspects of your online marketing, the system can provide important, real-time reports on specific key metrics, and even actual ROI (either in an e-commerce setting or when you stipulate the value of other behaviors and transactions). Because you really need to understand how your products/services are considered, purchased, and followed up on by your team, Infusionsoft is not a great choice for startups. To get the most out of the system, you need to have a clear picture of how your overall online marketing plans interact with sales and customer service. Fees for Infusionsoft range from $199 to $999 per month. It’s not super cheap like an email-only provider such as Mail Chimp, but this software does a LOT more, and once you start poking around you’ll think of many more campaigns you want to set up, and sequences to launch. And that’s ultimately the best aspect of Infusionsoft – it changes the way you think about online marketing and what’s possible and prudent within that realm.